It was like watching Michael Jackson in a Pepsi commercial all over again. 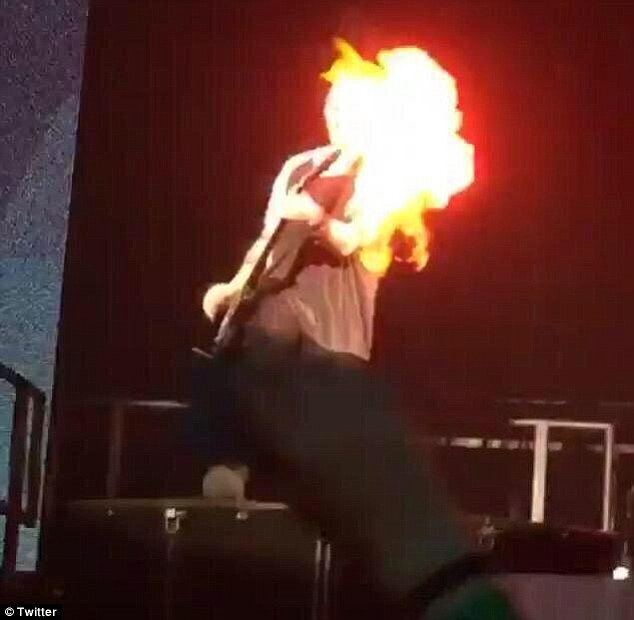 Guitarist Michael Clifford of the popular Australian band 5 Seconds of Summer recently found out the hard way what happens when you get too close to on-stage flame effects - see the video here. Luckily, Clifford escaped the incident relatively unscathed. Both NFPA 1: Fire Code and NFPA 101: Life Safety Code® mandate compliance with NFPA 160: Standard for the Use of Flame Effects Before an Audience wherever flame effects are used near an audience in an assembly occupancy. Adherence to the requirements contained in these standards can help prevent the type of close call experienced by the members of 5SOS and their fans. These and many other issues that are often cited were discussed and information on how to be better prepared for surveys in these areas was provided. The audience came ready with plenty of questions that were all answered. Anne also reviewed The Joint Commission equivalency process and the relation to the CMS waiver process. She clarified that proactive equivalency requests are still being accepted by The Joint Commission but all equivalencies that are received must now be sent to the appropriate CMS regional office for final approval. NFPA 285, Exterior Walls-and Leap Frogging? Come to Session M44 today at 11:00 and Session T74 at 3:30 on Tuesday to learn about this topic. In the last 7 years, a series of rather spectacular fires involving exterior wall systems have been publicized. Because these fire occurred in high rise buildings, they received international attention. A combination of new materials, new energy rules, new ideas for weather resistance/moisture control and innovative composite assemblies are presenting some previously unknown challenges. Marry those attributes with an aesthetic quality that the architect is trying achieve, and some very interesting looking (and functional) cladding and façade designs appear. Right at this moment, NFPA, the Fire Protection Research Foundation (FPRF) and ASTM International are looking at the potential refinements that may be needed in applicable codes and standards to address these designs. This multi-pronged approach is helpful and shows how it takes different groups to look at different solutions to achieve the goal of reducing this particular fire challenge. -NFPA 285, Standard Fire Test Method for Evaluation of Fire Propagation Characteristics of Exterior Non-Load-Bearing Wall Assemblies Containing Combustible Components. The test standard is in cycle and will soon be soliciting public comments on proposed changes to the next edition. The comment period will be open until November 16, 2015. -FPRF. The FPRF report "Fire Hazards of Exterior Wall Assemblies Containing Combustible Components" was issued in June of 2014. The report captured information on various fire scenarios and among other subjects discusses the procedures on how these wall assemblies are currently tested. A second phase project dealing specifically with metal composite material panels (MCM Panels) will be launching soon. Retro-Commissioning vs Re-Commissioning- Whats the Difference? that, unfortunately, will be off limits to the C&E attendees. photo) can challenge your way finding. McCormick Place – a sprawling facility. extension 6060 on a house phone or call 312-791-6060 from your cell phone.